One can hardly fathom the possibility of a communal riot taking place anywhere near Moscow. 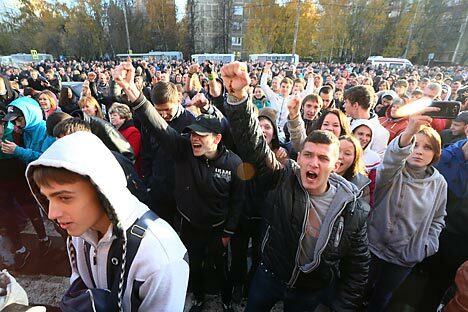 A majority of Muscovites would probably not have even heard of Biryulyovo until Sunday, when rioters ran amok in the distant outpost of the capital. While the fanciest of cars do the rounds of Moscow’s city centre and the prices at jam-packed restaurants can compete with some of the most expensive places on earth, there are some neglected areas in the city where there is growing discontent with life. The whole migration factor just adds fuel to the fire. When commenting on the riots, human rights groups and NGOs will shout “racism” from the rooftops, but that would be a case of over-simplifying the situation. Slowly but surely ethnic ghettos are being formed in many parts of Russia. Blue collar migrants usually move into relatively inexpensive localities and then subsequently bring their relatives and friends from their countries. In addition to hard-working labourers, a significant number of criminals sneak in to Russia. A close friend living in a locality just outside Moscow city limits, which has been witness to a influx of immigrants from Tajikistan told me recently that he wants to rent out his apartment and move to Prague as soon as his mortgage has been paid off. “I don’t want my family to be in danger because of the Tajiks and others,” he said. The area has witnessed growing crime and this friend claims that the police aren’t serious about fighting the menace. These migrants from Central Asia and former Soviet republics move into Russia freely since they don’t require visas to enter the country. There are a large number of unscrupulous Russian businessmen who are ready to pay these people under the books, instead of giving a fair wage to Russians. Unless these two basic factors change, illegal immigration to Russia just won’t stop. It’s not just Moscow that is considered a lucrative place to live for these migrants. The massive construction activity in Sochi for the 2014 Winter Olympics is largely relying on illegal migrant labour. Since the work has to be done, the authorities deliberately look the other way. Cities in the far north, Siberia and the Russian Far East are also witnessing an influx. Khabarovsk, a beautiful city in the Far East, had a visible number of Chinese immigrants right until 2007. These migrants were forced out when a law forbidding foreigners to work in outdoor markets was put into place. Taking their place over the last 6 years are the migrants from former Soviet republics. These migrants don’t just work in outdoor markets. They do all sorts of jobs that Russians just won’t, like driving buses, carpentry and cleaning the streets. There are certain jobs that educated Russians may be willing to do for a price, but some jobs are just considered well below dignity. Without immigrants, these are jobs that just won’t get done. Uncontrolled and unregulated migration has changed the face of many cities and affected the general culture. Six years ago, if I wanted to go for a late-night walk in Yuzhno-Sakhalinsk I’d be fine unless I was drunk and was heading into a bad neighbourhood. On my most recent trip there, even the most non-prejudiced people I knew asked me not to walk out alone late-night, claiming that Tajik criminal gangs had a free hand to do whatever they wanted. I was told that as a visible foreigner I would be at a far greater risk than a Russian person. The newspapers also carried reports of crimes committed by migrants. One particular story that shocked me was about a few men being arrested for setting up a cell of the Hizb ut-Tahrir, a radical Islamic group that is banned in Russia for terrorist activities in the Caucasus. We’re talking about a city that is 7 time zones away from the hotbed of terror in Russia! Just like my close friend in the Moscow region wants to immigrate to Prague for a better life, many people living in former Soviet republics find the grass in Russia to be much greener. The Czech Republic has a proper system of migration control and a good legal framework and procedure. Russia, on the other hand, is in serious need of immigration reforms. Obviously, the policy of open borders for citizens of some former Soviet republics is doing more harm than good. To prevent the formation of ethnic ghettos, it’s essential that Russia relook at its visa-free policy with these CIS countries. Migration can be beneficial both to Russia and the former Soviet countries that supply the migrants if the process is planned, streamlined and regulated. At the same time, one of the pressing needs of the country is police reforms. Russia needs an honest and motivated police force, whose employees are paid well enough to afford a decent standard of living in a country, where prices seems to rise every other day. If citizens have no faith in the police and the justice system, then there will be more incidents like the rioting that took place over the weekend.